The day is bright; clouds build in thick lines from the southwest and a fresh breeze blows over the bright water but these never quite overcome the warming autumn sun. 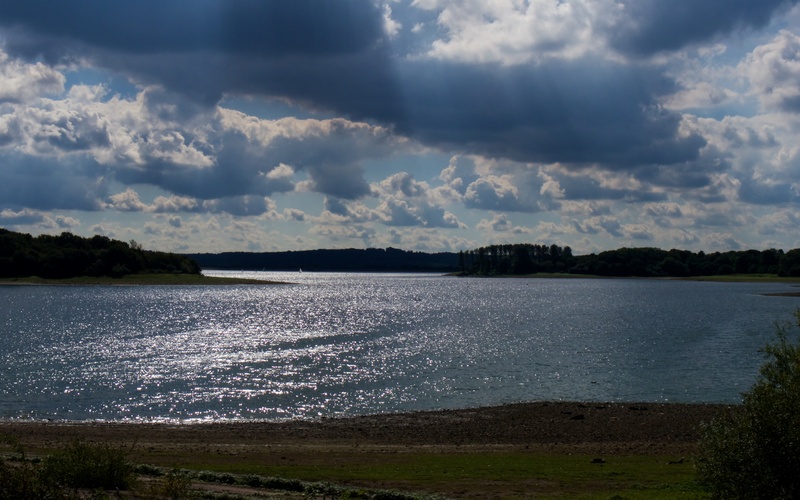 Bough Beech Reservoir is observed from the low causeway with its gently shelving banks of concrete, softened over the decades by a spreading, soft carpet of mosses and lichens. This is a tale of two views. Look south in the midday hours, blink in the blinding sun, weep in the wind and stare across a wide expanse of choppy water with sailing boats and distant concrete dam at the silhouetted flocks. Bough Beech Reservoir from the causeway looking south into the sun and prevailing wind. 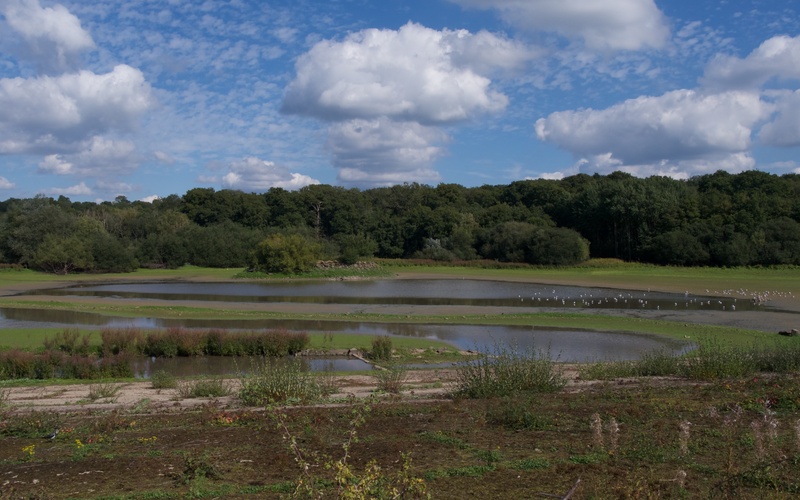 The reservoir edges to the bright south are harsh stone and dark mud beneath a fringe of thick scrub and woodland; in places, beneath the high water mark, are wide lawns of tightly cropped grass. There are also a few war-torn tree stumps, remnants of another life. Small floating islands, presumably for breeding common terns, sit high in the water like old D-Day relics. The waterscape is artificial; an ersatz lake full of sleek dinghies and fat birds idling in the warm sun. Herds of immigrant Canadas and feral greylags honk ceaselessly at each other and sound like gridlocked rush hour in the rain; quarrelsome herons chase one another from prized fishing spots; there are lines of sun-dried cormorants, drifts of sleeping mallard and gadwall and flying flocks of flighty teal. A solitary whistle from a wigeon comes from somewhere in the silhouettes. Black-headed gulls sit in groups or circle the water, lapwings and moorhen meander the edges. Grebes and coot float inshore and make up the familiar assemblage. The sailing boats and the fishermen are kept up the south end and the birds have free rein over the north. Birdwatchers keep watch from the causeway. A benign, well-heeled landscape of zonation with a place for everything and everything in its place. The view north is another world; the light is kind and the wind behind you, there are intimate pools of dead water and dull mud beneath a dark woodland of dense oaks, the North Downs escarpment of thickly wooded beech and Scot’s pine rises beyond. This is where most of the good stuff is found. The view to the north; the moss-covered causeway, shallow pools, mud, rushes and grassland. Today, three black-tailed godwits are feeding in the north end and an immature shelduck dabbles in the muddy fringes. Half a dozen teal fly in with acrobatic ease. Everything keeps to the far side. A kingfisher zips low across and then back, whistling loudly from somewhere behind a poolside willow. The godwits are noteworthy; occasional migrants that will not linger long. Autumn brings a random assortment of such passage waders, most are common but then there is the odd rare one like a grey phalarope that spent an afternoon here a few days ago. The unexpected is one reason that the regular watchers frequent the causeway hoping for a red letter day, listing their winnings on sheets of paper pinned within the glass-fronted noticeboard. The light is bright and the colours rich. 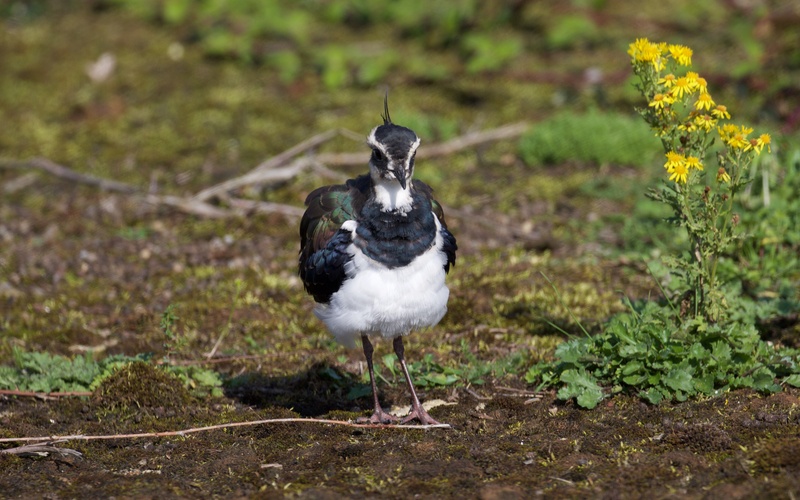 A lapwing works the mossy causeway a few yards from the roadside unperturbed by its proximity to peering binoculars and pointed cameras. 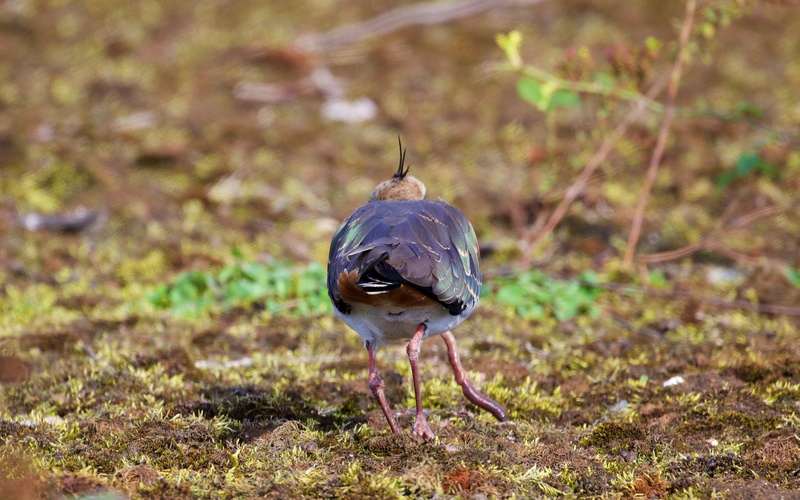 The bird moves slowly and purposefully, always standing upright and elegant but walking with a balanced stoop. The black crown and crest sits above a white supercilium and large, bright eye with a dirty charcoal line below. 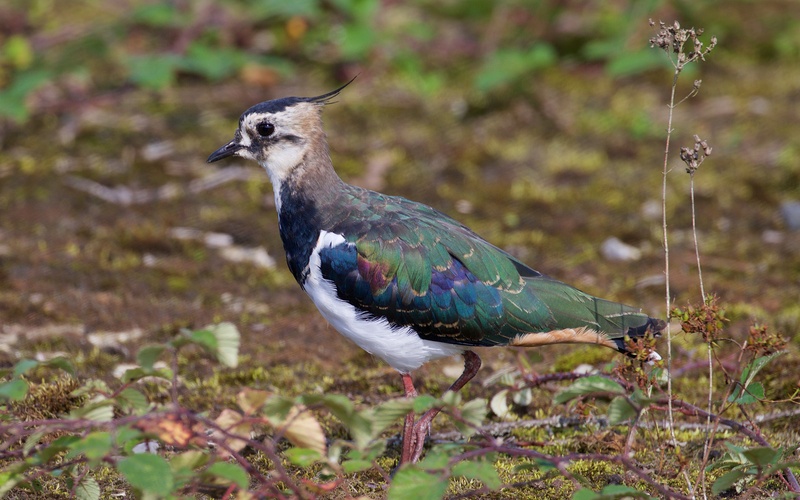 The nape and upper scapulars are a light purple wash above metallic deep greens but with two rich copper red feathers hanging over the navy blue coverts. The under tail coverts are an even orange buff. The colours shimmer in the sunlight; the bird is a picture of autumn colours. Clouds hide the sun and immediately all turns to dull dead monochrome. 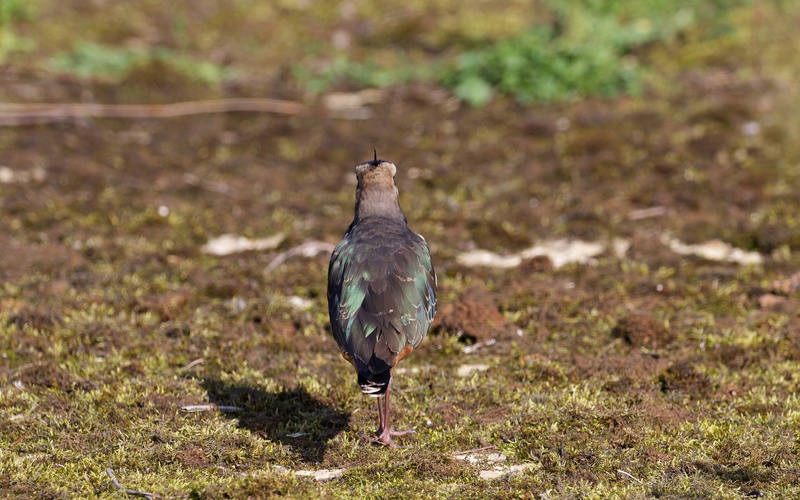 The lapwing stands and watches before walking on. An occasional preen and fluffing up. And then the reason for the patient presence so close to the roadside, a fat earthworm pulled from the thick moss. 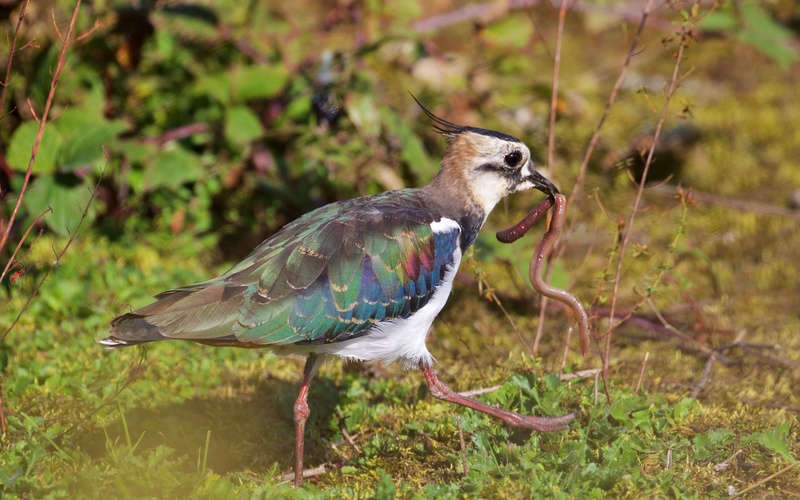 The lapwing walks quickly away down the slope to devour its prize.